Pencil Lift: Manuscript Gg can be drawn without pencil lifts. 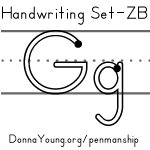 Lowercase "g" could have a pencil lift, but it is not necessary unless the instructor requires it. I have an animation for both a one-stroke and a two-stroke lowercase g.
Animations are linked below, worksheets further down this page. Listed below are a few of the words with short definitions. The site-cd, YoungMinds, is available for sale after having been unavailable because of our home repairs. ALTERNATELY, you can Subscribe to YoungMinds, Donna's best website. YoungMinds is like donnayoung.org, it has most of the same URL's, BUT YoungMinds contains exclusive content and there are no 3rd party ads messing up your view of this awesome website.